Do I Get Diagnosed Correctly? I can tell especially from Facebook discussions that people across the globe wanting to know about their "Blastocystis status" are worried that they are receiving false-negative results from their stool tests, and that many Blastocystis infections go unnoticed. And I think I should maybe try and say a few things on this (please also see a recent blog post on diagnosis, - you'll find it here). I might try and simplify things a bit in order not to make the post too long. 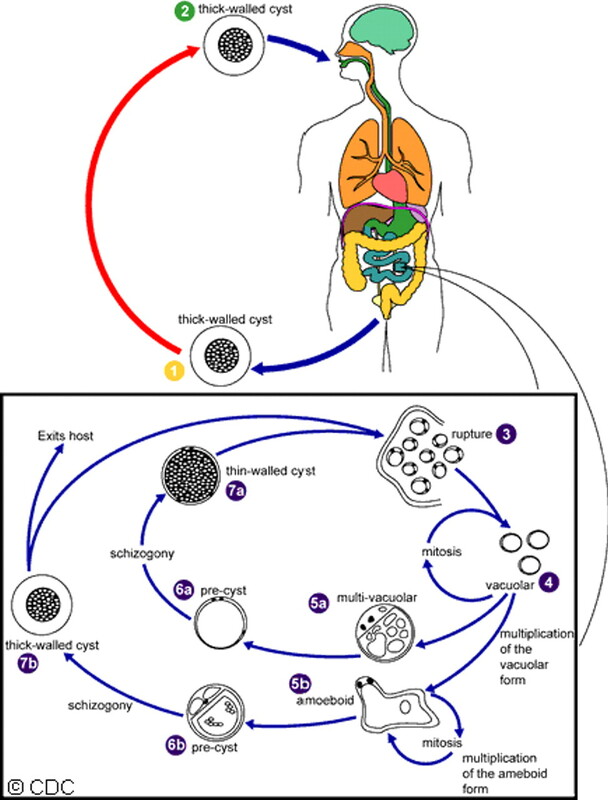 Below, you'll find a tentative representation of the life cycle of Blastocystis. It is taken from CDC, from the otherwise quite useful website DPDx - Laboratory Identification of Parasites of Public Health Concern. Proposed life cycle of Blastocystis. I don't know how useful it is, but what's important here is the fact that we accidentally ingest cysts of Blastocystis, and we shed cysts that can be passed on to other hosts. The cyst stage is the transmissible stage, and the way the parasite can survive outside the body; we don't know for how long cysts can survive and remain infective. In our intestine and triggered by various stimuli, the cysts excyst, transiting to the non-cyst form, which could be called the trophozoite / "troph" stage, or to use a Blastocystis-specific term, the "vacuolar stage" (many stages have been described for Blastocystis, but I might want to save that for later!). This is possibly the stage in the life cycle where the parasite settles, thrives, multiplies, etc. You can see a picture of vacuolar stages in this blog post. Many protozoa follow this simple life cycle pattern, among them Giardia and most species of Entamoeba. If the stool is diarrhoeic and you are infected by any one or more of these parasites, it may be so that only trophozoites, and, importantly, no cysts, are shed! This has something to do with reduced intestinal transit time and, maybe more importantly, the failure of the colon to resorb water from the stool which means that the trophozoites do not get the usual encystation stimuli. Importantly, trophozoites are in general non-infectious. There is documentation that once colonised with Blastocystis, you may well carry it with you for years on end, and as already mentioned a couple of times, no single drug or no particular diet appears to be capable of eradicating Blastocystis - this is supported by the notion that Blastocystis prevalence seems to be increasing by age, although spontaneous resolution may not be uncommon, - we don't know much about this. Now, although day-to-day variation in the shedding of Blastocystis has been described, it is my general impression that colonised individuals may shed the parasite with each stool passage, and well-trained lab technicians/parasitologists will be able to pick up Blastocystis in a direct smear (both cysts and trophs may be seen). To do a direct smear you simply just mix a very small portion of the stool with saline or PBS on a slide, put a cover slip over it and do conventional light microscopy at x200 (screening) or x400 (verification). Very light infections may be difficult to detect this way, and if you don't have all the time in the world, a direct smear may not be the first choice. Only troph stages have been described for Dientamoeba fragilis and it may be transmitted by a vector, such as pinworm (look up paper by Röser et al. in the list below for more information); this mode of transmission is not unprecedented (e.g. Histomonas transmission by Heterakis). Eggs of pinworm may be present in faeces, but a more sensitive method is the tape test. Now, Blastocystis often disintegrates in the faecal concentration process, and while you might be lucky to pick up the parasite in a faecal concentrate, you shouldn't count on it, and hence the method is not reliable, unless the faecal sample was fixed immediatley after being voided. This is key, and also why fixatives are used for the collection of stool samples in many parts of the world - to enable the detection of fragile stages of parasites. There are many fixatives, e.g. SAF (sodium acetate-acetic formalin), PVA (poly-vinyl alcohol) and even plain formalin will do the trick if it's just a matter of preserving the parasite in the sample. If SAF or PVA is used, this allows you to do permanently stained smears of faecal concentrates, and you will be able to pick up not only cysts of protozoa, but even trophozoites. Trichrome and iron-haematoxylin staining are common methods and are sensitive but very time-consuming and may be related to some health hazards as well due to the use of toxic agents. But this way of detecting parasites is like good craftmanship - it requires a lot of expertise, but then you get to look at fascinating structures with intriguing nuclear and cytoplasmatic diagnostic hallmarks. Truly, morphological diagnosis of parasites is an art form! Notably, samples preserved in such fixatives may be useless for molecular analyses. (note the "dirty" cytoplasm characteristic of E. coli). At our lab we supplement microscopy of faecal concentrates with DNA-based detection of parasites. For some clinically significant parasites, we do a routine screen by PCR, since this is more sensitive than microscopy of faecal concentrates and because this is a semi-automated analysis that involves only DNA extraction, PCR and test result interpretation, which are all things that can be taught easily. Major drawbacks of diagnostic PCR is that you cannot really distinguish between viable (patent infection) and dead organisms (infection resolving, e.g. due to treatment). This is why, in the case of Blastocystis, you may want to do a stool culture as well (at least in post-treatment situations), since only viable cells will be able to grow, obviously. Two diagnostic real-time PCR analyses have been published, one using CYBR Green and one using a TaqMan probe. Now, it certainly differs from lab to lab as to which method is used for Blastocystis detection. Some labs apparently apply thresholds for number of parasites detected per visual field, and only score a sample positive if more than 5 parasites per visual field have been detected. I see no support for choosing a threshold, since 1) we do not know whether any Blastocystis-related symptoms are exacerbated by parasite intensity, 2) the number of parasites detected in a faecal concentrate may depend on so many things which have nothing to do with the observer (fluctuations in shedding for instance), and 3) the pathogenic potential of Blastocystis may very well depend on subtype. If Blastocystis was formally acknolwedged as a pathogen, like Giardia, standardisation of methods would have happened by now. Meanwhile, we can only advocate for the use of PCR and culture if accurate diagnosis of Blastocystis is warranted, while permanent staining of fixed faecal samples constitutes a very good alternative in situations where PCR is not an option. I have the impression that some labs do DNA-based detection of microbes, including protozoa, and that a result such as "taxonomy unknown" is not uncommon. I don't know how these labs have designed their molecular assays, and therefore I cannot comment on the diagnostic quality and relevance of those tests... it also depends on whether labs do any additional testing as well, such as the more traditional parasitological tests. However, we do know that there is a lot of organisms in our intestine, for which no data are available in GenBank, which is why it is sometimes impossible to assign a name to e.g. non-human eukaryotic DNA amplified from a stool sample. * More than 1 billion people may harbour Blastocystis. * Blastocystis is found mainly in the large intestine. * 95% of humans colonised by Blastocystis have one of the following subtypes: ST1, ST2, ST3, ST4. * DNA-based detection combined with culture ensures accurate detection of Blastocystis in stool samples and enables subtyping and viability assessment.